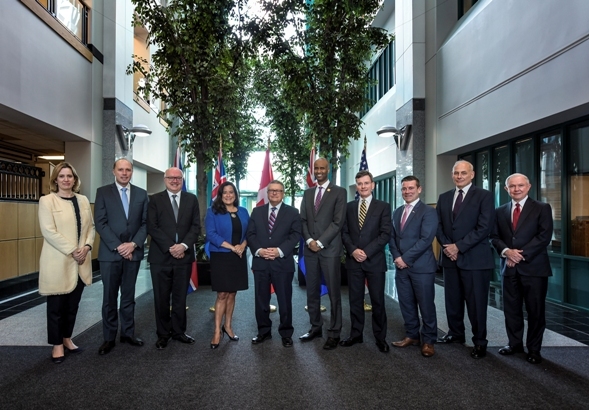 The Five Country Ministerial brought together members of the ‘Five Eyes’ to discuss the relentless threat of terrorism, violent extremism, cyber-attacks and international instability. The Home Secretary used the opportunity to secure support in the removal of extremist and terror content online. The five countries agreed to sign a joint letter to Google, Microsoft, Facebook and Twitter urging further action in removing hateful content and moving forward the industry led forum to tackle the issue. A copy of the letter can be found here. It follows the announcement from the major service providers, Google, Facebook, Microsoft, Twitter that they will set up an industry wide forum to counter the spread of dangerous propaganda online. The forum will provide technical solutions, share information and give support to smaller companies. The Home Secretary's response to the news can be found here. During the visit, the Home Secretary, writing for Canadian newspaper, the Globe and Mail said the UK and its allies stand shoulder to shoulder in the fight against terrorism. I arrived in Ottawa on Sunday for my first visit to Canada. Sadly it comes as the UK is still recovering from a series of appalling and cowardly terrorist attacks that left dozens of people dead and hundreds injured. In May, a devastating attack in Manchester left 22 people dead and 59 injured after a suicide bomber targeted children at an Ariana Grande concert in Manchester. On 3 June a van was deliberately driven into pedestrians on London Bridge, before three men got out of the vehicle and began stabbing people in a nearby food market. Eight people were killed and 48 injured. And then last Monday, we woke to the news of a man driving into a group of Muslim worshipers in North London. One man who had fallen ill before the attack died, and nine others were treated in hospital. 31 innocent people dead and over 100 people hospitalised. People from nations across the world, including a Canadian, Christine Archibald, were affected. She was a victim of the London Bridge attacks. Those acts of terrorism represent the worst of humanity. But in those darkest of moments we also saw the best of humanity. The bravery, professionalism and above all incredible sacrifice of those emergency services who work to keep us safe. And the response of communities in Manchester and London – refusing to be cowed by terror. Rather than being divided by the recent violence, people seemed to come ever closer together. I greatly appreciate the messages of support we received from our friends in Canada, the US, Australia and New Zealand. Our countries stand together and are clear that terrorists will never win. This is why I am here in Ottawa. As close allies, we five countries are coming together to focus on the threats we all face and how the international community can respond. As part of this, I am clear we have to work together to tackle the poisonous ideologies behind the attacks, and that means halting the spread of dangerous terrorist and extremist propaganda online. As Da’esh continues to suffer catastrophic losses in Syria and Iraq we are seeing their followers increasingly utilise the internet and social media to spread hate and encourage acts of terrorism in the West. This is a problem that transcends borders and a truly global effort is needed to make a real difference. In March I held a roundtable with major internet companies to urge them to do more. It is important that industry take ownership of this issue. Not just in dealing with the problem today but also the challenges we will face in the future. We know whenever solutions are presented, the terrorist methods mutate and change. Companies such as Google, Facebook, Microsoft and Twitter are working on a new industry-wide forum that will seek to provide technical solutions, share information and capabilities and give support to smaller companies. The companies have already started demonstrating this work. The development of technology, which will take down content before anyone is able to see or disseminate it, is progressing. It is vital that companies continue to invest in this technology. Through combined international effort we can help advance the work of communication service providers, including the launch of the forum. In May, the G7 committed to supporting this approach and increasing pressure on industry. And two weeks ago, the UK Prime Minister Theresa May and France’s President Macron announced a joint UK-France action plan, which included an explicit commitment to the forum. But more can always be done. I am confident that the UK’s friends in Canada and beyond stand with the UK in protecting all our people and halting the destructive venom of online radicalisation.